Killed New Orleans, LA, April 1, 1869. Raffaele Agnello was a Palermo, Sicily, Mafioso who set up a Mafia organization in New Orleans just after the American Civil War. Agnello settled in the Crescent City before the war in 1860. He resided for a time with his brother Joseph in New Orleans' Fifth Ward (the central third of the French Quarter). When Confederate forces and the local police abandoned New Orleans during the Civil War, Agnello served in a home-guard police force of immigrants (who were considered neutral in the War Between the States). He continued in that role during the federal occupation of the city. Agnello became a powerful underworld leader in New Orleans' Little Palermo in the later 1860s. 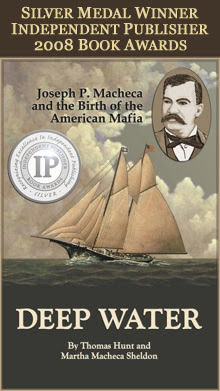 His gang of transplanted Palermitani came into conflict with a community of immigrants from Messina who gained the support of a local gang led by native New Orleanian Joseph "J.P." Macheca. After a bitter and bloody feud, Agnello appeared to have defeated his rivals. However, he was then ambushed and killed in 1869 in front of Macheca's fruit store near Old Levee Street and Toulouse Street. A blunderbuss pistol was fired in Agnello's face while he walked with his godson and bodyguard Frank Sacarro. Sacarro shot at and wounded his godfather's assassin, but the gunman fled through a nearby bakery shop. Agnello's brother Joseph continued a losing struggle for years before he, too, was murdered. Joseph Agnello was shot to death on a vessel moored at the Picayune Tier on April 20, 1872. The Macheca organization later gave way to the "Stuppagghieri" Mafia organization run by the Matranga family.